Union Minister Dr Jitendra Singh addressing the session on Northeast and "Act East Policy" during the ASEAN Summit at New Delhi on Wednesday. NEW DELHI, Dec 13: As a first major step to initiate work on landmark Katra-Delhi Road Expressway, the Government of India has appointed M/s. Feedback Infra as DPR Consultants to carry out the alignment studies. The proposed Expressway measuring 600 kms will be the longest of its kind in the country and the total cost of road construction alone will be approximately Rs 25,000 crore, but this is excluding the cost involved in land acquisition which may add on by several thousand crores more. Disclosing this here today, Union Minister Dr Jitendra Singh, who is also the Member of Parliament from the area, said that the project has been consistently followed up over the last two years and expressed gratitude to Union Transport Minister Nitin Gadkari for having agreed to push through the proposal for a world-class, 6/8 lane expressway which would be not only the longest in the country but will also offer the option of shortest route from Delhi to Katra via Amritsar. Dr Jitendra Singh said the first step in the execution of the project has been accomplished by appointing a DPR consultancy and though the completion of the entire project will take many years because of the requirements of land acquisition and road construction through difficult terrains, but once the expressway becomes functional, it might reduce the journey time from Delhi to Katra simply to 5 to 6 hours and people may then prefer to travel by road instead of taking an air route or train to Delhi. He said, the expressway will prove a great economic booster by enabling overall development in business, trade, accompanied by generation of jobs and revenue. Dr Jitendra Singh said, he has been regularly interacting with the officials in the National Highways Authority of India (NHAI) and there is also a plan to develop the Katra-Delhi Expressway corridor into a ‘state-of-the-art’ structure with sophisticated “Intelligent Transport System”, “Incident/Accident Management” controlled by Advance Traffic Management System (ATMS) such as Emergency Call Boxes, Mobile Communication System, Variable Message Sign System, Video Incident Detection System, etc. 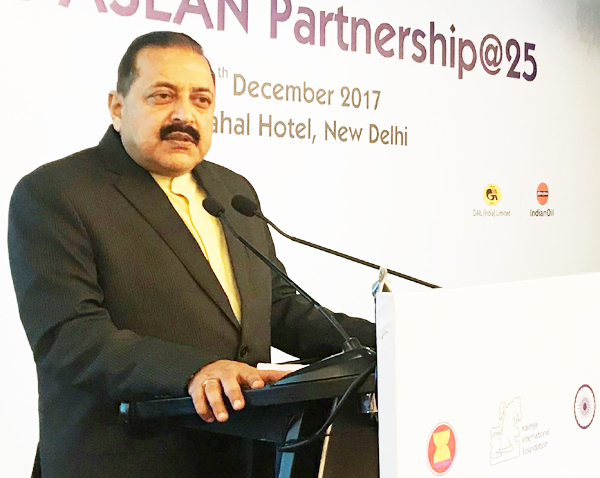 Meanwhile, speaking at the inaugural session of the ASEAN Summit here today , Dr Jitendra Singh said that in the last three to four years,Northeast has been fully equipped for ASEAN collaboration in business and trade with country’s across the eastern borders. He said, it is his considered view that in order to “Act East” effectively distal to the eastern borders, it is imperative that first we have to strengthen ourselves proximal to these borders . Elaborating this, he said, because of the common lifestyle, eating habits and culture, an effective trade with ASEAN countries is possible only through the produce and products from Northeast. To bring in the ease of business, Dr Jitendra Singh said, the Modi Government has launched an exclusive North East Industrial Promotion Policy (NEIPP). Similarly, the present Government finalized Indo-Bangladesh agreement for exchange of enclaves, which has facilitated transport and connectivity in the region and this is a step which could have been taken even 40 years ago right at the time of the birth of Bangladesh. In order to promote trade movement within and across the region, Dr Jitendra Singh said, a network of roads is being spread, a double-gauge rail track is being laid in all the eight States barring Sikkim and also the first – ever rail connection to Bangladesh from Tripura. First-ever Water Highways are also being developed across Brahmaputra and Bay of Bengal for transportation of goods within and beyond the borders, he added.